Most young parents are concerned about everything when it comes to their children – their health, their schedules, the toys they play with, and of course, their development. Parents want their children to behave appropriately, and meet their “milestones.” Sometimes, however, you may notice that your child is not sitting during “circle time,” or seems cranky more than expected. Every child is different and sometimes parents begin to question if their child is “okay” or not. 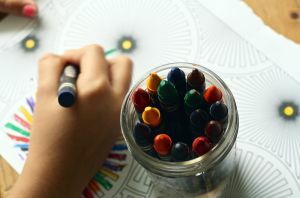 When these behaviors persist, parents may wonder if their child has attention deficit hyperactivity disorder (ADHD), one of the most common disorders affecting children. Children are often not identified as having ADHD until they are in school, but children as young as three or four can be tested for ADHD. The main characteristics associated with ADHD are inattention, hyperactivity, and impulsivity. Left untreated, those with ADHD can struggle with organization, sitting still, and maintaining focus, which impacts their ability to learn and maintain relationships. While there is no cure for ADHD and children do not “outgrow” ADHD, early intervention and treatment can significantly help those with ADHD be successful. Since most young children can be hyperactive, impulsive, and inattentive at times, it can be difficult to know if your child is exhibiting typical behavior or showing signs of ADHD. As a parent, you know your child best, but relying on the expertise of your child’s teachers and mental health professionals is important for proper evaluation and treatment. If you notice the following symptoms both at home and at school (or preschool or daycare) consistently, it may be time to have your child evaluated for ADHD. While parenting is challenging, know that having a child with ADHD is not your or your child’s fault. Although there is not a definitive cause linked to ADHD, know that there is nothing you as a parent did wrong. What you are doing right, is getting your child the help that he or she needs. Want to learn more about ADHD? Visit the American Academy of Child and Adolescent Psychiatry’s ADHD Resource Center.